More photos are taken of people than any other photographic subject. Whether your thing is casual slice of life photos, or you want to do more formal portraits, here are some excellent books to help you take memorable and eye-catching photos. It helps to have a basic understanding of metering, lighting, and the fundamentals of people photography. A good introduction is in Digital photography Exposure for Dummies. Read the chapters on metering, lighting, and people photography. Then you can move on to some specialized books. For sheer inspiration covering the whole realm of people photography, both casual and formal, it is hard to beat The Joy of Photographing People by Kodak. The wealth of photos will give you a lot of ideas and there are plenty of suggestions for taking better photos of people. If you only read one book on people photography, this is the one to get. For a book more focused the art of portrait photography, read The Portrait: Professional Techniques and Practices in the excellent Kodak Workshop Series. Both of these excellent books are out of print but well worth tracking down in the used market. Robert Caputo’s National Geographic Field Guide: People & Portraits is a good, brief introduction to people photography. Steve Sint’s Digital Portrait Photography: Art, Business, and Style is a more detailed look a formal portrait photography. This book is targeted at people who want to do portrait photography as a business, but don’t let that stop you from reading this book. The majority of the chapters aren’t about starting a business. All of the information on equipment, lighting, and posing are excellent for anyone who wants to create quality portraits. If you only buy one detailed book on portrait photography, this should be it. 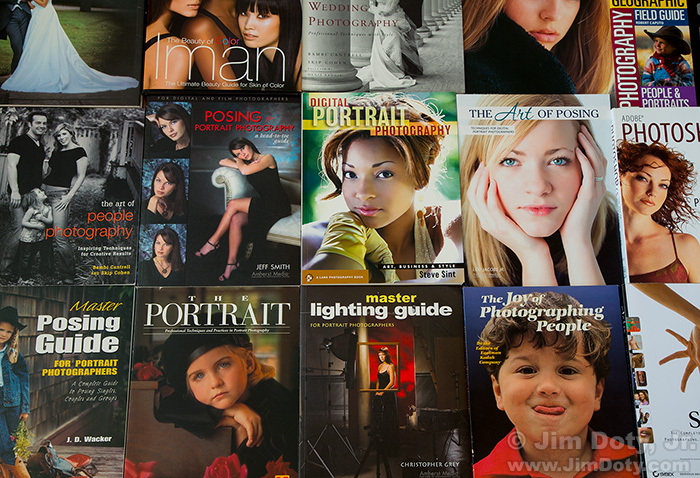 To dig deeper into portrait photography, you will need to read specialized books on lighting, posing, and digital retouching. Here are some of the best. Studio lighting is a one of the keys to great portrait photography, and the more you learn about it the better. One of the best books is Christopher Grey’s Master Lighting Guide for Portrait Photographers. Then read Christopher Grey’s Advanced Lighting Techniques: Tricks of the Trade for Digital Photographers. If beauty and glamour photography is your thing, then read Christopher Grey’s Lighting Techniques for Beauty and Glamour Photography: A Guide for Digital Photographers. If you want to learn how to create the older lighting styles from the early to mid twentieth century, read Christopher Grey’s Vintage Lighting. To learn how to pose people, read Jeff Smith’s Posing for Portrait Photography: A Head-to-Toe Guide for Digital Photographers and Jeff Smith’s Posing Techniques for Location Portrait Photography. Another good posing guide is Lou Jacob’s The Art of Posing. If you are experienced with Photoshop and you are ready for some advanced techniques for editing photos of people, read Skin (2nd version), by Lee Varis. The title and cover photo are provocative, but there are a lot of really useful ideas. One of them is color correcting “skin by the numbers” by adjusting the CMYK values. Not many books tell you how to adjust CMYK values for people with different ethnic backgrounds. Another excellent advanced book is Kevin Ames’ Adobe Photoshop CS2: The Art of Photographing Women. For wedding photography, there are two must read books. One is The Art of Wedding Photography: Professional Techniques with Style by Cantrell, Cohen, and Reggie. It is an older book but it has a lot of excellent suggestions. The other is Steve Sint’s Wedding Photography: Art, Business and Style (film version) or Sint’s Digital Wedding Photography: Art, Business & Style (digital version). If you want to get into the business of portrait photography, Photography Q&A: Real Questions. Real Answers by Zach Arias is absolutely essential reading. You order these books from Amazon, by going to the people photography section of my photography store. It has direct links to Amazon.com so you get Amazon’s great prices, fast delivery, excellent service, and first class guarantee. This entry was posted in Books, General by Jim. Bookmark the permalink.